Only 1 mile from Market Rasen Town, the Market Rasen Racecourse Camping & Touring Site is set on the edge of the distinctive landscape of the Lincolnshire Wolds. Walkers, cyclists, families and dogs are all welcome and greeted by friendly and helpful staff to the caravan park. A perfect location for touring or relaxing with a fantastic new children's play park opened in 2018 and its own 9-hole golf course to challenge golfers of all abilities and a separate dog exercise field. The historic town of Market Rasen is just one mile away and offers many small shops, pubs, food outlets and a supermarket. The quiet country roads make walking, cycling and driving a pleasure. The site puts you in easy reach of coastal towns, country villages, family activities and many locations associated with Lincolnshire's rich history of war time aviation. The caravan site has access to bus and train links to Lincoln, Newark, Louth and Grimsby. It is also a great base for walkers with the Viking Way just 2 miles from the site and the deep rich natural landscape of Willingham Woods right next door. 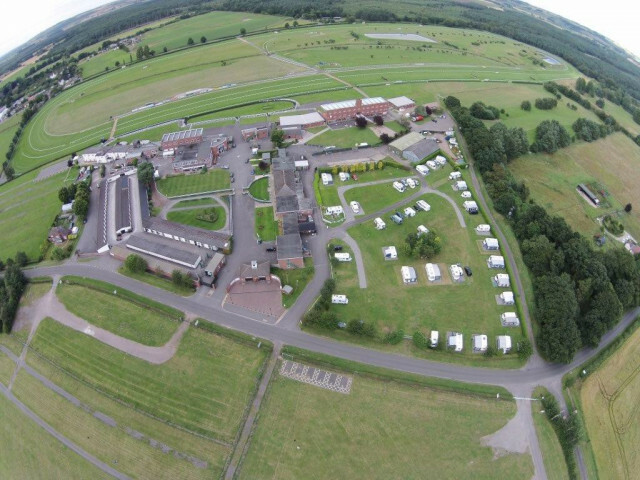 MARKET RASEN RACECOURSE CAMPING & TOURING PARK, Legsby Road, Market Rasen, LINCOLNSHIRE, LN8 3EA.